Up to 70% off Single Checks. $22.50 for 4 boxes of single checks.Can be repeat custome. 2/23/14 Did NOT work! said offer was invalid or no longer available! $7.50 per box, free shipping/handling and free custom lettering. 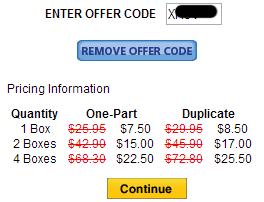 Up to 65% OFF box of checks and get free shipping when order's over $22.50. 15% OFF on any orders and get free shipping when order's over $22.50. Up to 37% OFF box of checks and get free shipping when order's over $22.50. Apply the coupon code to get Free 4th box of checks, Free designer lettering, free Upgrade to designer's choice checks. Apply the coupon code to get Free 4th box of checks. Designer Checks was founded in Anniston, Alabama in 1992, and is recognized today as a leader in the direct-check industry. Through the years, they have succeeded and grown by maintaining a high level of Customer service. At Designer Checks, they remain loyal to their founding principles and continue to take pride in offering Customers quality checks, exceptional value, and an extensive offering of great check designs.